Members of the Baltimore Appliqué Society reproduced two Wayside Roses quilts from a 1920's Marie Webster design and donated them to support restoration of the Marie Webster House in Marion, Indiana. This colonial revival house is where Marie Webster lived from 1902 to 1942, and where she designed her famous quilts and operated a successful pattern business. 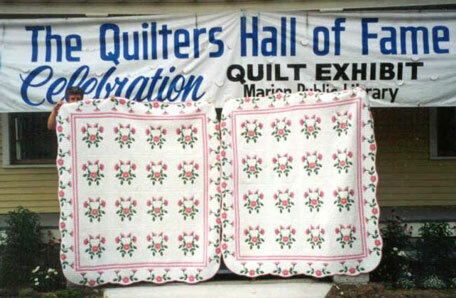 The house is now the permanent home of the Quilters Hall of Fame. The Quilters Hall of Fame, founded in 1979 by Hazel Carter, is a non-profit organization dedicated to honoring those who have made outstanding contributions to the world of quilting. The Marie Webster House is also a unique museum housing the archives that document America's quilt making heritage. Each year in July a "Celebration" is held in Marion, Indiana, during which a new Quilters Hall of Fame honoree is inducted. Honorees are selected on the basis of their life's work and influence. During "Celebration 2000" a drawing for the "opportunity quilt" to support the restoration of the Marie Webster House was held. Both this quilt, and its identical twin, were made by members of the Baltimore Appliqué Society. The twin quilt was donated to the permanent collection at the Marie Webster House.